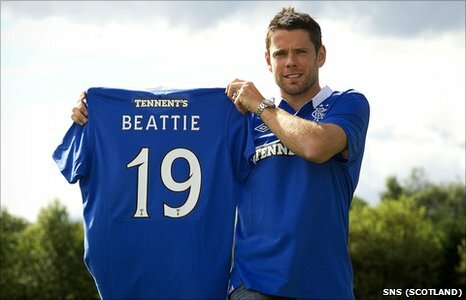 Rangers have signed former England striker James Beattie from Stoke for an undisclosed fee. The 32-year-old has agreed a two-year contract with the option of a further 12 months and is the Scottish champions' first signing in two years. "There was interest from other clubs but when you come here and speak to Walter Smith and have a look around, the decision was easy," said Beattie. "I'm delighted to sign for a club like Glasgow Rangers." Beattie rarely featured for Stoke after a much-publicised bust-up with manager Tony Pulis in December. And the former Blackburn, Southampton, Everton and Sheffield United forward fell further down the pecking order at the Britannia Stadium after the arrival of Kenwyne Jones this week. The experienced striker has been given the number 19 shirt and goes straight into the squad for Saturday's league opener at home to Kilmarnock. "It was quite a quick deal as far as I'm concerned," added Beattie. "I came to Ibrox on Thursday morning and was met by the gaffer and (chief executive) Martin Bain. "They showed me around the stadium, which was magnificent and you can see it is a club steeped in history. "I then walked out on to the pitch, which was magnificent. "The walk out, even when the stadium was empty, was something, so I'm looking forward to walking out when it's full." Rangers have also made an offer for Tommy Smith but Portsmouth are reluctant to sell the forward. Smith turned to the English duo as hopes of landing Rapid Vienna star Nikica Jelavic diminish. "The longer negotiations drag on, the more doubtful a deal appears," said Smith of the Rapid Vienna star on Thursday. Smith will be hoping Beattie can fill the gap left by prolific marksman Kris Boyd, who left Ibrox under freedom of contract to join Middlesbrough. And Beattie is sure he can pitch in with his fair share of goals in Scotland. "I've always been confident in my own ability so I'm not going to say no," he replied when asked about filling Boyd's boots. "We'll have to see but I'm confident I can. "Hopefully I'll score goals and a big part of my game is working hard and making sure the defenders don't have much time to settle on the ball. I think I'm good in the air. "As an older player, the amount of games I've played, I've learned to create a space for myself and for others and hopefully bring other people into the game a lot better." A deal for Smith may prove difficult, with Pompey manager Steve Cotterill unwilling to part with the 30-year-old. On Thursday he told BBC Radio Solent: "Rangers' offer is irrelevant because he's not somebody we want to sell. "We're trying to build a team around our better players - and that includes Tommy Smith. "We're not in the dire financial straits that everyone thinks we are. We might have been a couple of months ago, but we're not now."